Guys, I’m addicted to sardines. It’s kind of a weird thing to be addicted to since I’m pretty sure most people are just lukewarm about them. But they are so good. Sardines are salty and rich and good on a ton of different foods. They get a really bad rap though and a lot of people find them “gross.” Some of those same people have no issue eating a deep fried piece of strange fish product from a fast food place. At least this fish looks like fish! If you think you don’t like sardines, I implore you to give them a second shot. This Sardine Sandwich is one of my new favorite lunches and I hope it doesn’t scare you away. 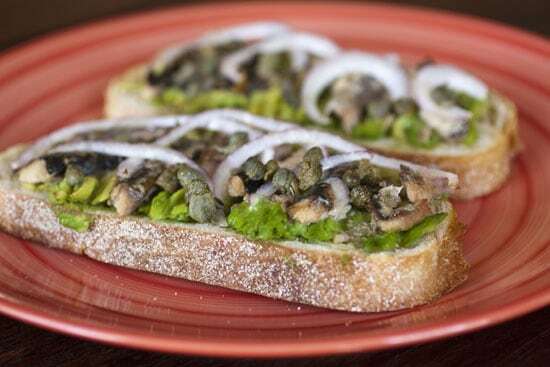 A healthy and quick open faced sandwich made with mashed avocado and sardines. Then it’s broiled and topped with a few simple toppings. 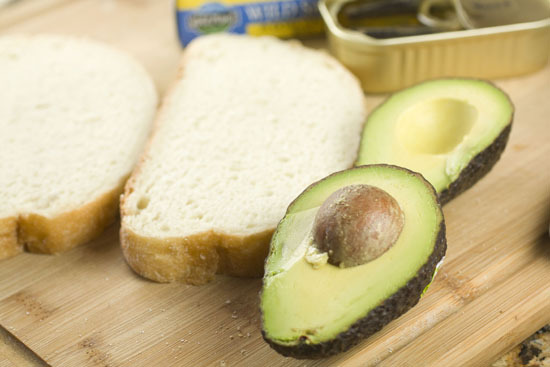 1) Remove pitt from avocado and add to two slices of thick bread. Mash onto bread like a spread. 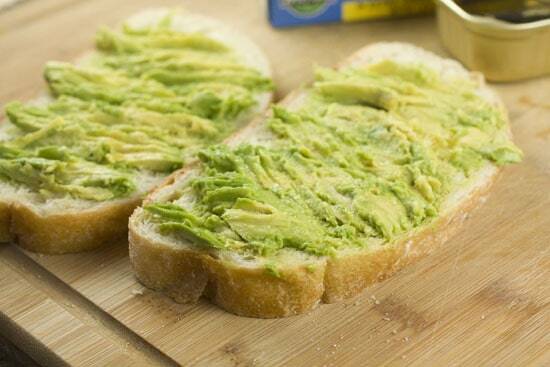 Use 1/2 an avocado per bread slice. 2) Top each half of bread with a few sardines, roughly chopped. 3) Top each sandwich with slivered red onion, capers, a drizzle of olive oil, and some fresh black pepper. 4) Bake sandwiches at 425 for 5-6 minutes or broil for 2 minutes. Adapted from Alton Brown's sandwich. The sardine section at most grocery stores can be intimidating. There are a bunch of different options and some are better than others. Personally, I like wild caught sardines that are stored in olive oil with lemon. These tend to be on the more expensive end of sardines. A can will set you back about $3-$4, but I find that these taste the best. Shop around though and try a few different kinds until you find one you like. When it comes down to health, sardines are amazing. They are a great source of vitamins and nutrients and contain a lot of Omega-3s. Because they are really low on the food chain, they also have very little traces of mercury which some larger fish can have. They may just be the perfect lunch food in my opinion. Alton Brown agrees with me. He attributed a good chunk of his weight loss to sardines and, in fact, this sandwich idea came from him. 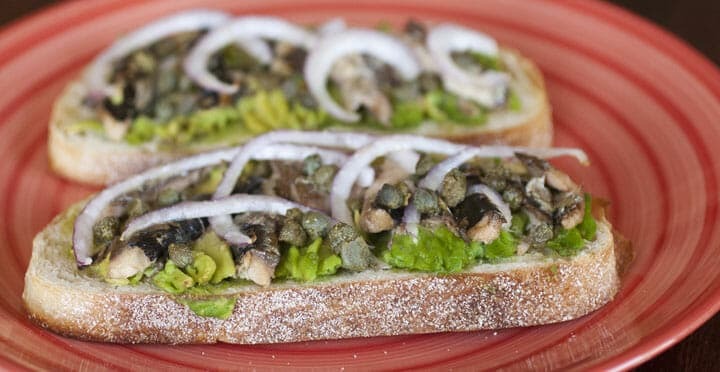 I like to make this Sardine Sandwich in open-face form. Try to get some good thick and crusty bread for the sandwich that can hold up to the toppings. Half an avocado per slice. I used a whole avocado for two pieces of bread. I suggest you do the same. The avocado works almost like mayonnaise and forms a kind of sauce for the sandwich. A nice thick layer of it really helps. Then just throw a few sardines on each piece. If you have large sardines, you might want to chop them roughly. I also topped my sandwich with some sliced red onion and capers. 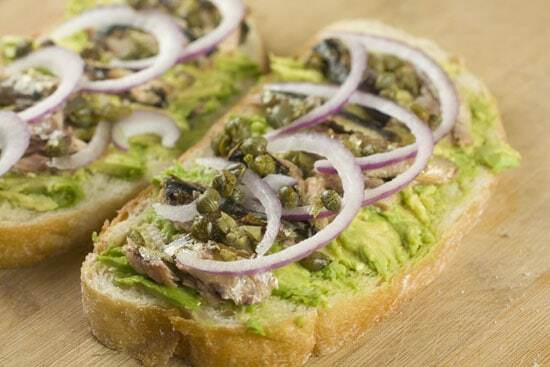 The capers are optional, but I think the red onions really add a nice flavor to the sandwich. If you don’t use sardines that are stored with lemons, you might want to squeeze some lemon juice on the sandwich also. Drizzle the sandwiches with a small amount of olive oil and toast these bad boys in a 425 degree oven for about six minutes or you can broil the sandwiches under high heat for about 2 minutes. After a quick bake or broil. This is really a simple sandwich but probably not something that a lot of people would think to try. At the end of the day though, it’s really healthy, filling, and very tasty. I can’t get enough of the flavor combo. So, how do you feel about sardines? Do you love them? Raise your hand if you’re never reading Macheesmo again because of this sandwich! I love that you wrote about something as “taboo” as sardines! My husband thinks I’m nuts and that they smell terrible. I have to sneak in anchovies anytime I need to add them in. I’ve always loved sardines; the taste compliments strong, funky, and brine flavors like a strong cheese, olives and capers so well. I wish more people would give them a shot, but hey, if stuff like beef tongue and oxtail can make it on to fancy restaurant menus maybe the sardine has a shot… It could be the new bacon! I’ve never tasted sardines before – are they similar to anchovies? Anchovies I love, especially on pizza, but last time I ordered a pizza with anchovies, the small wirey bones kept getting stuck in my gums, and completely turned me off. Do sardines have bones? Thanks! They are similar to anchovies in that they are both tiny fish. Normally anchovies are salted and have a stronger fish flavor. But it all depends on the brand. 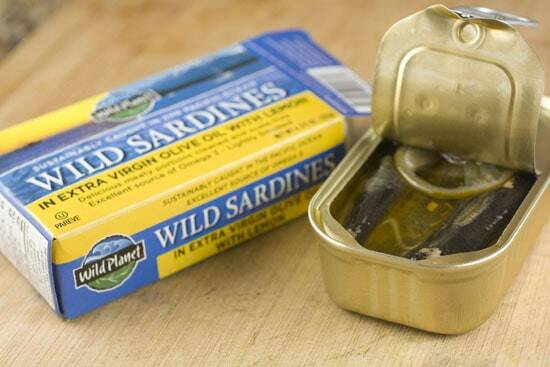 Most sardines also have bones because they are packaged whole although you can find fillets. I’ve never had a problem with their bones getting stuck in my gums though… they are super tiny and pretty much dissolve. I’m sure I’m weird, but I’ve always liked sardines. I just got tired of them because it seemed there wasn’t a whole lot I could do with them to be “interesting.” But this looks fantastic, thanks! I knew they were good for me, good for the earth because they’re sustainable, etc., etc., but I just couldn’t get past the heads, skins, and bones. I’m sure my solution isn’t for the purists out there, but I found I could buy them skinless, headless and boneless, either in water or olive oil. Now they’re a pantry staple, used in salads, a fish salad like tuna but with sardines, even in mac & cheese instead of tuna. (The tuna I buy is line caught and pricey, so it gets doled out carefully.) Hooray for sardines! The ones I buy are without the head but with skin and bones. I’m not really opposed to the head, but that’s just the brand I like the most. Whatever works for ya! Sardines aren’t for everyone, but this is a great intro way to try them out. I really liked that episode. Kudos to you! I thought the sandwich looked pretty good but I don’t know if I have the nerve to try it. hopefully its still better than eating blue fin tuna? Sardines and avocado sound like an intriguing combination! Yes! Sardines are the fish of the future, I think. My husband likes them on crackers with hot sauce or strong mustard, I like them with pasta and lots of chili flakes. I made (and blogged) Dorie Greenspan’s sardine rillette a little while ago and it was SO good. As far as brands go, we’ve decided that Cole’s is the best if you can find them, Goya is just fine, but Prince is not as good. And I’ve never had a problem with the bones since they separate pretty easily from the filets – I just remove the spines as i take the sardines out of the can. I too lazy to even remove the bones although you’re right. They do just flake off. I’m with you, Nick. This is my lunch probably once a week. Once I heard about the sardine/avocado combination from Alton Brown, I’ve been disgusting people with it ever since. Oh well if they don’t like it – more for me! I’ll have to try the caper and onion addition. Don’t forget the hot sauce! Omg! Just made this for dinner tonight, my husband and I loved it. For anyone who thinks this might be a weird combination, just try this I think you will be surprised how good it is. I love sardine sandwiches, usually have one once or twice a week. I’ve never tried it with avocado, but I will now. My standard recipe is sliced red onion, sliced tomato, a few pieces of romaine, and a dash of balsamic vinegar. The challenge is to find the right bread. Portuguese rolls are pretty good, but my favorite is a very dense multi-grain pan loaf from Balthazar in New Jersey. Superb! So simple, but so delicious. I have anew lunch staple. Glad you’re on Gojee! I`ve been eating sardines and avacados a long time,no bread,just olive oil,black salt, pepper,italian cheese hard. too good ! I really want to try this! I found your blog by searching sardine and egg sandwich on google images. No egg on yours, but it looks great with the avocado. For those concerned about bones, they are not crunchy and I don’t notice them at all. I wonder if crispy bacon would be good on this. Why am I asking, of course bacon is good on pretty much any sandwich. Thank you for this great looking recipe. I love sardines and avocado — so when I did a search for the two and came to your recipe I was delighted. I thought It would be a long shot to find a recipe for toast with those two ingredients. Glad I was wrong. Can’t wait to try it out this evening!